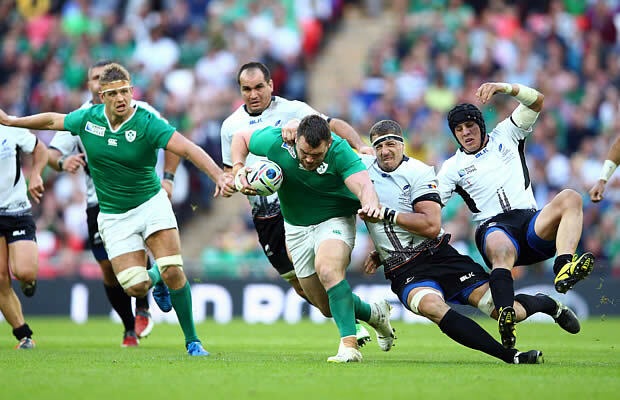 Ireland powered to a 44-10 Rugby World Cup Pool D victory over Romania at Wembley Stadium in London on Sunday in front of a new World Cup record crowd. The match was attended by 89,267 fans surpassing last weekend’s record breaking Rugby World Cup crowd of 89,019. Ireland winger Keith Earls scored two tries which equaled Brian O’Driscoll’s record as Ireland’s leading World Cup try scorer in the match. 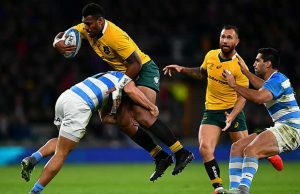 Twenty-seven-year-old Earls took his World Cup try scoring tally to seven tries while fellow wing Tommy Bowe also score two tries with Rob Kearney and Chris Henry getting the others. Ireland’s second successive easy victory — in front of a record World Cup crowd of 89,267 at Wembley — sets them up nicely for more challenging Pool D matches against Italy and then France. Romania had already put in over 40 tackles by the time the game reached the five minute mark, indicating the tough match ahead. Ian Madigan put the Irish 3-0 up in the eighth minute to reward their early pressure. 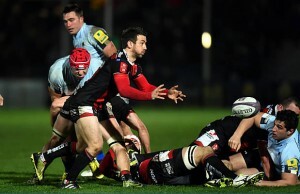 But Darren Cave was penalised for not rolling away and Valentin Calafeteanu kicked the penalty to level affairs. The Irish looked to have scored one of the tries of the tournament so far when Simon Zebo rushed down the left wing. But his celebrations, including sticking his tongue out at his fan club, proved to be premature as the television official ruled it out for a foot still in touch when he collected his kick ahead. Madigan added a penalty for 6-3 and Ireland turned on the style again with Earls prominent in creating the move that swept from the left hand side to the right and Bowe managed to touch the ball down before he was bundled into touch. The Ulsterman’s 29th test try was welcome as he had been pilloried for his performance in the warm-up Test defeat by England — Madigan landed a fantastic conversion from the touchline for 13-3. Zebo turned creator in the 27th minute. Seeing Earls free wide out on the left wing he floated a long pass out to his Munster team-mate and Earls had no problem in running the ball in to make it 18-3. Earls drew level with iconic centre O’Driscoll four minutes into the second-half, running onto Eoin Reddan’s kick through and touching it down. Madigan converted for 25-3. Romania held the Irish at bay for the next 15 minutes but referee Craig Joubert eventually lost patience with some gamesmanship by the Romanians and sin-binned Csaba Gal on the hour mark. Within seconds the ball had been whipped out of the scrum and along the line for Bowe to go in for his second of the game. Madigan landed another stunning conversion from wide out on the right for 32-3. The Irish ran in another superb try minutes later, Zebo the spark again unselfishly offloading to Kearney to score — though more worryingly the fullback, who was struggling for fitness prior to the tournament, limped back to the halfway line. Madigan failed for once to land the extras to leave the Irish leading 37-3. Henry added another try as the Romanians wilted and Madigan added the conversion for 44-3. But there was a great cheer when veteran Romanian lock Ovidiu Ionita scored a try right at the death in what is his fifth World Cup.